A founding member of the OSG, Yves Léveillé has a degree in music and received the Prix du Conservatoire de musique du Québec à Gatineau in clarinet and chamber music. After serving as acting director and director of this conservatory for a few years, in 1985 he went on to teach the clarinet, chamber music and introduction to orchestra conducting, while continuing to manage the orchestra’s choir. Eleven-time winner of grants from the Government of Quebec, he has taken professional development internships in clarinet in Chicago with Robert Marcellus, in contemporary music, choir direction, song and violin basics. Mr. Léveillé studied orchestral conducting at Sienna, Italy, thanks to financial support from the Canada Council for the Arts and the Government of Quebec. Yves Léveillé was nominated artist of the year and received Gatineau’s Culturiades Prize in the “Creation” category in 1998. 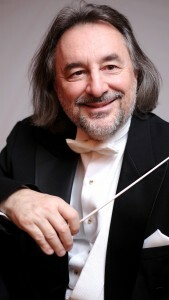 As a conductor, Mr. Léveillé has directed the Orchestre régional de l’Outaouais on numerous school tours. With Orchestre symphonique de Gatineau, Mr. Léveillé has directed several orchestral creations for various artists such as Bruno Pelletier, Luc De Larochellière, Luce Dufault, Daniel Lavoie, Natalie Choquette and Marie-Denise Pelletier, to name just a few. Mr. Léveillé played bass clarinet with the Ottawa Symphony Orchestra from 1983 to 2003, first clarinet with the Orchestre des Concerts symphoniques de Gatineau for almost 20 years, and first clarinet with the Savoy Society of Ottawa. He is a founding member of Ensemble du Jeu Présent and of the Avignon wind quintet, and he also served as Director of the École de musique d’Orléans (MIFO) from 1992 to 1995. From 1999 to 2003, he directed Les Productions lyriques de Gatineau. As a clarinettist and conductor, Yves Léveillé has been involved in numerous recordings such as: Contretemps/Go, Sax Lib, Passions symphoniques, Keep Close to God, Classic Gypsy, Hommage à la chanson française, with Noël Samyn, Les Deux Rives and L’artiste de Noël, with the orchestra and the Top Passion vocal group. Mr. Léveillé managed the famous Canadian Guitar Quartet, and founded the TGIF/Enfin vendredi concert series. After working with a local communications and marketing agency for 13 years, Yves Marchand founded Les Productions Logiscène in October 2005, an artistic production and marketing/communications firm. More recently, Les Productions Logiscène handled the project coordination for Champlain 2013 in Gatineau, program direction for Place de la Cité, in Gatineau and artistic direction of the cultural program for the finale of the Jeux du Québec, which were held in Gatineau in the summer of 2010. The firm also regularly organizes conferences and forums in the region, and provides artistic direction for several major events, including the opening and closing ceremonies for the Jeux de la francophonie canadienne, which were held in Gatineau in July 2014. Yves Marchand is also the Founder and Artistic Director of Top Passion, a popular performance group that has been active in the Ottawa valley for more than 25 years. He holds a bachelor of music degree from the University of Ottawa, and is renowned for his unique composition style. To date, he has more than 700 musical arrangements for voice and symphony orchestra to his credit, and has written a dozen musical comedies, which were presented at salle Odyssée. A superb strategist, as well as a committed music lover, Jean Turpin has been an investment adviser at FBN since 1987, as well as branch director from 1996 to 2004. In addition to participating in the Gestion des meilleures pratiques d’affaires program, in 2005, he became a senior associate in the Solutions fortunes privées program. As the head of Groupe Turpin, he is continuously innovating to help his clients identify and achieve their goals. This father of four travels around the world with his wife, using his talents as a photographer to capture fascinating images from a variety of countries. The Board of Directors of the Orchestre symphonique de Gatineau includes individuals whose expertise is as varied as it is unique, but who are also totally and utterly dedicated to the artistic development of our city and our region. Beyond that, they are all great music lovers.